Here is the skein of white yarn that went into the dyepot where I simmered and then steeped birch and cherry bark (taken from the ground around the trees in a local arboretum after a storm). 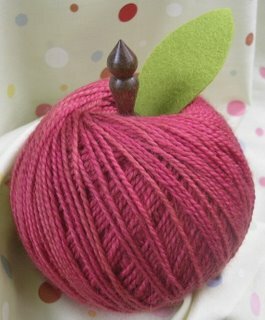 After an hour of processing, the yarn had only turned a pretty, light tea color from all the tannic acid in the bark, but no trace of pink that the birch and cherry palettes from Jenny Dean's Wild Color indicated. I can only guess why the pink didn't come out: the bark was waterlogged when I harvested it so I judged the proportion of bark to fiber incorrectly; or maybe the birch wasn't a species that produces color. I didn't want tea-stained yarn, so I added a teaspoon of ground cochineal to the bath. The combination of the tea stain and fuschia produced exactly what I wanted in the alpaca (picture to come) and in this merino, but the Kokopelli is too bright. Once a fiber is mordanted, however, you can throw it into the dyepot again just after wetting it out, so that skein will go in the next time I use logwood or maybe if I try indigo dyeing some time soon.